The No. 6/8 Denver Pioneers (16-8-3, 12-6-2 WCHA) play at No. 17 Minnesota Duluth (14-8-6, 8-7-5 WCHA) on Feb. 6-7. Puck drop is set for 6:07 p.m. MT each night at the DECC. Friday's game will be televised live on the NHL Network and broadcast live locally on AM 560. Both games will be audio cast on www.DenverPioneers.com. Denver owns a 103-69-9 advantage in the series that dates back to 1961. DU charted 5-1 and 2-1 victories over the Bulldogs on Nov. 7-8. Luke Salazar netted two goals, including the game-winner, and Marc Cheverie made 34 saves in the 5-1 win. Tyler Ruegsegger’s power-play goal at 8:16 of the third period gave DU a 2-1 win and series sweep on Nov. 8. Cheverie stopped 27 shots and was named WCHA Defensive Player of the Week for his efforts. DU scored two power-play goals in each win. The Bulldogs own a 37-34-5 mark against Denver in Duluth. Denver is 4-1-1 in its last six games in Duluth. The Pioneers are 4-1 in their last five games against Duluth and 7-3 in their last 10. The Minnesota Duluth Bulldogs are playing their best hockey of the season. Duluth has won five of its last six games, including two-game sweeps of Bemidji State and Minnesota State. The Bulldogs split (1-3, 1-0) a two-game set at Wisconsin last weekend. Goaltender Alex Stalock has posted three shutouts, while sophomore Justin Fontaine is second in WCHA scoring with 12-23--35 with a league-leading nine power-play goals. MacGregor Sharp has added 11-15--26, and Mike and Jack Connolly are tied for third in WCHA rookie scoring with 22 points each. Duluth is first in the WCHA in scoring defense at 2.29 gpg and seventh in scoring offense at 2.93 gpg. The Bulldogs rank second in the WCHA on the power play at 21.2% and eighth on the penalty kill at 80.5%. Head coach Scott Sandelin has posted a 136-168-43 record in nine seasons at Duluth. The University of Minnesota Duluth (UMD) is a regional branch of the University of Minnesota with about 11,000 students on campus. As Duluth's public research university, UMD offers 12 bachelor's degrees in 75 majors, graduate programs in 20 fields, a two-year program at the School of Medicine, a four-year College of Pharmacy program, and a Doctor of Education program. The chief executive officer of UMD is Chancellor Kathryn A. Martin. She has been Chancellor since November 1995. Although the University of Minnesota Duluth didn’t officially make its appearance until 1947, its roots date to the Duluth Normal School, founded in 1896 to train women as teachers. In 1921, the Duluth Normal School was renamed to the Duluth State Teachers College, also known as DSTC. Shortly after the renaming, bachelor’s degrees and four-year degree programs were added to the school. In 1929 men began to come to the DSTC, and along with them, the first sports teams including hockey, football, and basketball. By 1937, the locals were fighting to make DSTC a University of Minnesota branch to increase funding and the overall reputation of the school. It was not until 1947 the DSTC became part of the University of Minnesota system and was again renamed, this time to the University of Minnesota Duluth, or UMD. Today, the UMD campus consists of more than 50 buildings on 244 acres overlooking Lake Superior. Most UMD buildings are connected by concourses or hallways due to the climate. UMD is also home to the Tweed Museum of Art, the Marshall W. Alworth Planetarium, Weber Music Hall, and the Marshall Performing Arts Center. Other UMD facilities include the Research and Field Studies Center, Glensheen Historic Estate, the Lower Campus, Minnesota Sea Grant, the Large Lakes Observatory, and the Natural Resources Research Institute. UMD has experienced a revamping of student amenities and subsidized research facilities over the past seven years, beginning in 2000 with the completion of a new library. Additional buildings built since 2000 include the Weber Music Hall, Swenson Science Building, Sports and Health Center addition, and the new Labovitz School of Business. The Bulldogs are the classic underdog program –with the more glamorous Big 10 University of Minnesota a few hours away in the Twin Cities with a huge statewide following for the Gophers, the Bulldogs, based in the working-class port city of Duluth, have always had to scratch, claw and work for every advantage they could get. The varsity hockey program dates to December of 1930, when Duluth State Teacher's College announced that intercollegiate ice hockey will be added to the institution's varsity sports program. Things got off to a really rough start when DTSC lost its first game to Duluth Central High School by a 3-0 score at the old Duluth Amphitheater, enroute to a winless 0-3 inaugural campaign under Coach Frank Kovach. The next year, DSTC did manage to beat Two Harbors High School by a goal 3-2 for a first victory, but the sport vanished for 14 years until reinstated in 1949, when the school, now known as the University of Minnesota-Duluth, beat Carleton College of Duluth to close out a 7-0 undefeated season against lower division schools as an independent. By 1949 the program had joined the Minnesota Intercollegiate Athletic Conference (small schools) and scored the first win over a D-I opponent in 1957 when the Bulldogs beat Michigan Tech. UMD had become a dominant power in the MIAC in the 50s, with six consecutive titles, setting the stage for elevation to full Division I status in 1961 under coach Ralph Romano, helped in part by Denver’s Murray Armstrong, who helped recruit UMD first D-I teams. The Bulldogs took their lumps at first; including a still-NCAA record of 77 saves performance in a loss against Michigan in 1964. Romano later became the school’s athletic director, and died tragically of heart failure while watching a UMD-DU game in Duluth in the mid 1980s. UMD continued to make progress in the mid 1960s, when the city built a new $6 million Duluth Arena-Auditorium complex with 5,600 seats, know known as the DECC (Duluth Entertainment and Convention Center) in downtown Duluth, which still serves as the home of the Bulldogs, but will soon be replaced by a new arena in 2010. With the new arena, was admitted to the WCHA in 1965, but did not win the first 14 WCHA games until an overtime victory over North Dakota in 1966. The tough games also stretched into eras, as the Bulldogs had only three winning seasons between 1965 and 1982. By 1971, UMD got perhaps its biggest program win (at the time) with a 15-3 win over rival Minnesota in Minneapolis, a game which set 12 school records, paced by all-American centers Walt Ledingham and Pat Boutette. Mike Sertich took over as UMD coach for Gus Hendrickson in 1982, and produced some of the best WCHA teams of the mid 1980s. In 1983, the Dawgs went to the NCAAs for the first time, but lost to Providence at Schneider Arena in Providence, 10-5 in a two game total goals series. 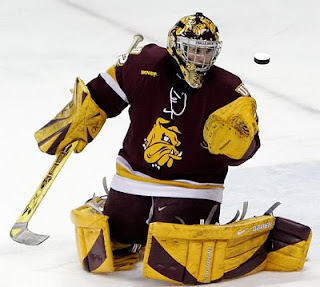 The next year, the Bulldogs won their first WCHA regular season title on Bob Lakso’s hat trick against Wisconsin in February, and were then forced to play a “home” WCHA playoff series in Minneapolis, as the Duluth Arena was already pre-booked with a boat show. The Bulldogs drew 7,000+ fans in Minneapolis and ran North Dakota out the building with an 8-1 victory in game 1, and later beat the same North Dakota team in overtime the NCAA semi-finals in Lake Placid 12 days later. UMD then faced Bowling Green in the NCAA title game, which went four overtimes before BGSU edged UMD for the title. Defenseman Tom Kurvers won the Hobey Baker Award that year as the first Bulldog to do so. 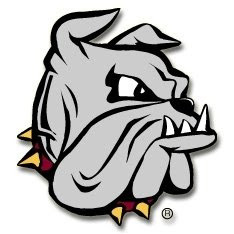 In 1985, the Bulldogs repeated as WCHA Champions, but fell to eventual NCAA Champion RPI, 5-4 in triple overtime at the Frozen Four, but the loss was sweetened with a victory over Boston College in the third place game the next day. Leading scorer Bill Watson became UMD’s second Hobey Baker Award Winner, and Mike Sertich was named WCHA Coach of the Year for the third year in a row. In 1986, the Bulldogs were in a tooth and nail battle with Denver and Minnesota for WCHA supremacy, but when forward Matt Christenson had a stroke during a boot hockey game in the stretch run, the shocked Bulldogs faded. Sophomore Brett Hull had a 50 goal season, but the Pioneers aced out the Bulldogs in the WCHA semi finals. After a couple of good years in the early 1990s with 1994 Hobey Baker winner Chris Marinucci scoring the goals including a WCHA title in 1993, the Dawgs did not reach the NCAA tournament again until 2004 in Boston, when the Pioneers bounced the Bulldogs and their talented 2004 Hobey Baker winner Junior Lessard from the Frozen Four. The University of Minnesota Duluth mascot is the bulldog, named Champ. When UMD was the Duluth State Teachers College, the traditional designation was "peds" for pedagogues or teachers, but this did not suffice as an appropriate image for UMD's athletic teams. In the spring of 1933 the athletes themselves picked the bulldog as the school's mascot. Originally named "Killer," the mascot's name was changed to "Champ" in 1997 to present a less violent image. Because the University's colors varied during the early years, William Watts Folwell, first president of the University, appointed English instructor Augusta Norwood Smith to choose permanent school colors. Smith, "a woman of excellent taste," according to Folwell, chose maroon and gold. First used sometime between 1876 and 1880, the colors weren't officially approved by the regents until March 1940. The original school colors of UMD were green and gold, when UMD was the Duluth State Teachers College. The colors were changed to maroon and gold after the campus became part of the University of Minnesota System in 1947. "Hail! Minnesota" was written by Truman Rickard, class of 1904, for use in a class play. University student Arthur Upson wrote a second verse in 1905. In 1945, the song became the official state anthem. The "Minnesota Rouser," sung at most University athletic events, was written by Floyd M. Hutsell in 1909 in response to a contest sponsored by the Minneapolis Tribune. The spirited "UMD Rouser" is a variation of the "Minnesota Rouser." Sing and cheer to be victorious UMD! * Robert Senkler - President and CEO of Securian Financial Group, Inc.
* Mark Pavelich and John Harrington were members of 1980 U.S. Olympic hockey gold-medal team that beat the USSR in the Miracle on Ice game. Duluth is a port city on the north shore of Lake Superior, which is linked to the Atlantic Ocean 2,300 miles (3,700 km) away via the Great Lakes and Erie Canal/New York State Barge Canal or Saint Lawrence Seaway passages. Duluth forms a metropolitan area with Superior, Wisconsin. Called the Twin Ports, these two cities share the Duluth-Superior Harbor and together are one of the most important ports on the Great Lakes, shipping coal, iron ore (taconite), and grain. As the county seat of St. Louis County, Duluth is the fourth largest city in Minnesota had a total population of 86,918 in the 2000 census. The metropolitan census including outer suburbs and villages was estimated to be roughly 184,000. 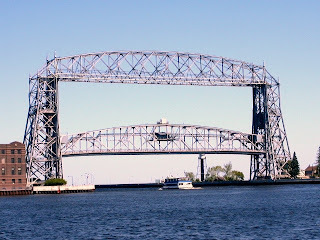 As a tourist destination for the Midwest, Duluth features America's only all-freshwater aquarium, the Great Lakes Aquarium, the Aerial Lift Bridge which spans the short canal into Duluth's harbor, "Park Point", the world's second longest freshwater sandbar, spanning 6 miles, and is a launching point for the North Shore. The city is named for Daniel Greysolon, Sieur du Lhut, the first known European explorer of the area. Native American tribes had occupied the Duluth area for thousands of years, trading and cultivating wild rice. In 1659, Pierre Esprit Radisson and Médard Chouart des Groseilliers went searching for furs in the Lake Superior region, and visited the area that became today’s Duluth. Sieur du Lhut, the city's namesake, arrived in 1679 to settle rivalries between two Indian nations, the Dakota and the Ojibwa, and to advance fur trading missions in the area. Interest in the area was piqued in the 1850s as rumors of copper mining began to circulate. A government land survey in 1852, followed by a treaty with local tribes in 1854, secured wilderness for gold-seeking explorers, sparked a "land rush," and led to the development of iron ore mining in the area. Around the same time, newly-constructed channels and locks in the East permitted large ships to access the area. A road connecting Duluth to the Twin Cities was also constructed. Eleven small towns on both sides of the St. Louis River were formed, establishing Duluth's roots as a city. By 1857, copper resources became scarce, and the area's economic focus shifted to timber harvesting. A nation-wide financial crisis led to nearly three quarters of the city's early pioneers leaving but the Lake Superior and Mississippi Railroad extension from St. Paul to Duluth opened areas due north and west of Lake Superior to iron ore mining. Duluth's population on New Year's Day, 1869 consisted of fourteen families; by the Fourth of July, 3,500 people were present to celebrate. In the 1900s, the city's port passed New York City in gross tonnage handled, elevating it to being the leading port in the United States. Meanwhile, there were ten newspapers, six banks, and an eleven-story skyscraper, the Torrey Building, already present in the town. In 1907, U.S. Steel announced that a $5 – $6 million plant would be constructed in the area. Although steel production only began eight years later, predictions held that Duluth's population would rise to 200,000 to 300,000. With the Duluth Works steel plant came Morgan Park, a once-independent company town that now stands as a city neighborhood. In the early twentieth century, Duluth was home to one of the largest Finnish communities in the world outside of Finland. The area was also settled by Immigrants from Ireland, Poland, Serbia, Italy, Ukraine, Romania, Norway, Hungary, Denmark, Sweden, Bulgaria, Austria, Croatia, England, and Russia. 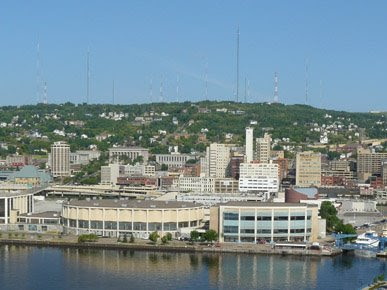 During much of the twentieth century, the city was an industrial port town, with a cement plant, nail mill, wire mills, and the Duluth Works plant. In 1916, during World War I, a shipbuilding plant on St. Louis River produced eight vessels simultaneously. A neighborhood was formed around this operation, today known as Riverside. Similar industrial operations were heightened during the Second World War. Population growth continued after the war, with a peak of 106,884 reached in 1960. Due to foreign competition, the U.S. Steel plant of the Duluth Works closed in 1981, presenting a major blow to the city. Duluth is often cited as "where the Rust Belt begins," and other industrial activity followed suit with more closures, including shipbuilding, heavy machinery, and the Air Force base. With the decline of the city's industrial core, the local economic focus shifted to tourism. The downtown was renewed with red brick streets and skywalks, and old warehouses along the waterfront were converted into cafés, shops, and restaurants, forming Canal Park as a largely tourism-oriented district. The city's population, for years experiencing a steady decline, has stabilized to around 85,000 in recent years. Duluth once fielded a National Football League team called the Kelleys (officially the Kelley Duluths after the Kelley-Duluth Hardware Store) from 1923-1925 and the Eskimos (officially Ernie Nevers' Eskimos after the early NFL great, their star player) from 1926-1927. The Eskimos were then sold and became the Orange Tornadoes (Orange, New Jersey). This bit of history became the basis for the 2008 George Clooney/Renee Zellweger movie, "Leatherheads." Looking at the analytics, Denver is second in the WCHA in scoring offense at 3.59 gpg and second in scoring defense at 2.44, 6th nationally in offense, and 15th in defense at 2.44 gpg. That compares with UMD’s 27th ranked offense (2.93 GPG) and 10th ranked defense at 2,29 gpg. Just looking at the numbers, DU has the offensive edge and UMD has the defensive edge in the series. But going deeper, UMD has the nation’s 4th best power play, while DU has the 16th best PK, and DU’s #43 power play is similar in its ineptitude to UMD’s 46th ranked PK. The net/net here is that UMD will likely get a PPG or two each night, while DU must step up and take advantage of UMD’s poor PK with an improved version of its own dreadful power play if it hopes to compete. Rhett Rakhshani is DU’s career scoring leader with 6-5--11 in 10 career games against the Bulldogs, while goaltender Marc Cheverie is 2-0 with a 1.00 GAA and .968 Sv% in two career starts against Minnesota Duluth. Those guys must lead the way if DU is going to get points, and with all the injuries facing DU (Bozak, Martin and Nutini) and struggles with defense and power play, I only see a statistically better but lukewarm DU team getting a single point against a red hot UMD team at home. And I would not be surprised if DU was swept, either. Prediction: Denver 3, UMD 3 Friday, UMD 3, DU 1 on Saturday.